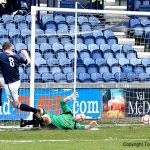 A last-minute goal by striker Brian Graham secured the points for Raith Rovers in a highly entertaining league clash against in-form Dumbarton at Stark’s Park this afternoon. 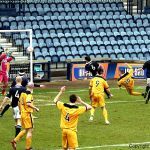 The sides shared four goals when the Sons visited the Lang Toun earlier in the season, although Dumbarton’s fortunes have increased considerably since then following Ian Murray’s appointment as manager. 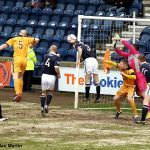 Having taken the scalps of league leaders Morton, as well as Partick Thistle and Falkirk during their renascence, it was clear that Rovers were in for a testing afternoon. The heavily-sanded pitch was less than conducive to flowing football, although both sides tried to retain possession during the opening exchanges. 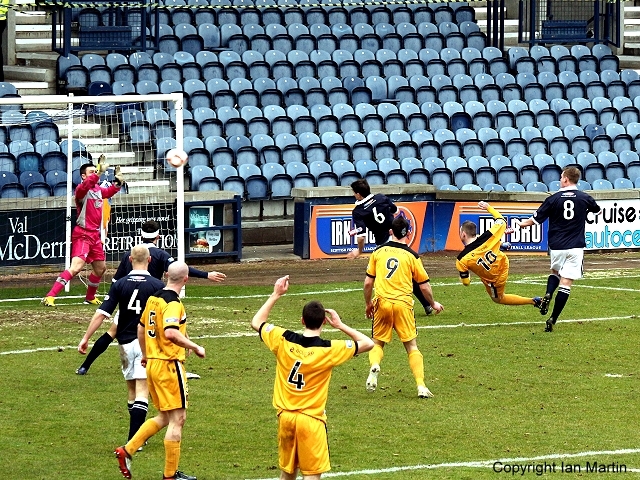 Dumbarton, in particular, looked dangerous, and would have opened the scoring after ten minutes but for as astonishing double save by David McGurn. 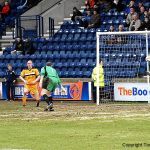 If the initial parry was impressive enough, the keeper’s follow-up low save from Bryan Prunty’s drive from six yards drew generous acclaim from the Rovers faithful. 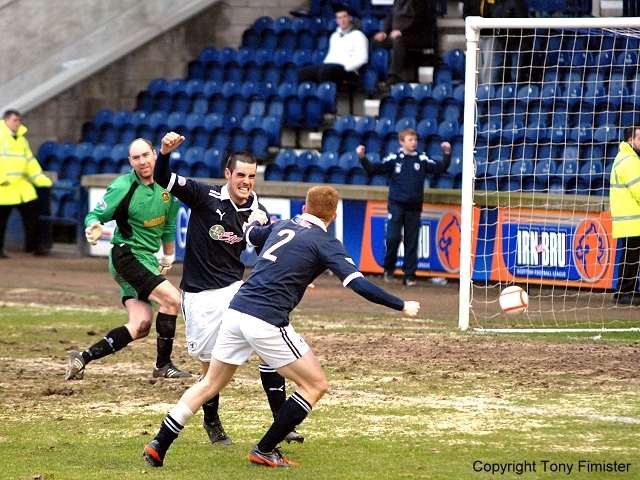 Five minutes later, Brian Graham had the ball in the net, but the referee’s whistle had already sounded for a push by Pat Clarke in the build-up. Clarke, who enjoyed an industrious afternoon, then burst forward from midfield, and slipped an inviting pass towards Graham, and his strike partner’s first-time shot from the edge of the box was turned round the post by Sons keeper Stephen Grindlay. Midway through the half, Rovers enjoyed a period of pressure as they went in search of the opening goal, and Clarke tried his luck with a shot from 25 yards which flew narrowly over the bar. 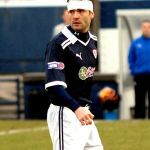 The match was then held up far a few minutes following a nasty-looking clash of heads between Laurie Ellis and Stephen McDougall, with the Rovers defender leaving the field for ten minutes for treatment on a head wound. 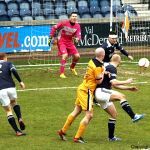 Despite being down to ten men at this point, Rovers continued to press forward, and Prunty earned the first yellow card of the match for a trip on Clarke as he looked to set up another Rovers attack. 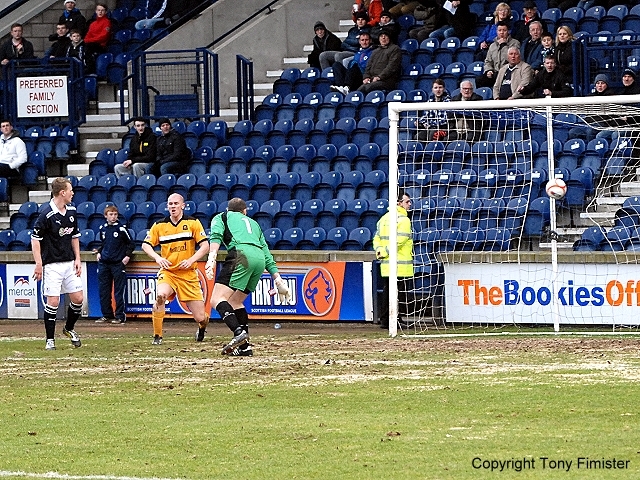 However, Rovers would not be denied and, with five minutes of the first half remaining, they took the lead. A searching cross into the Dumbarton box was flicked on amid a ruck of players, and Rovers captain Allan Walker, lurking with intent at the back post, drove his shot into the far corner of the net from close range. 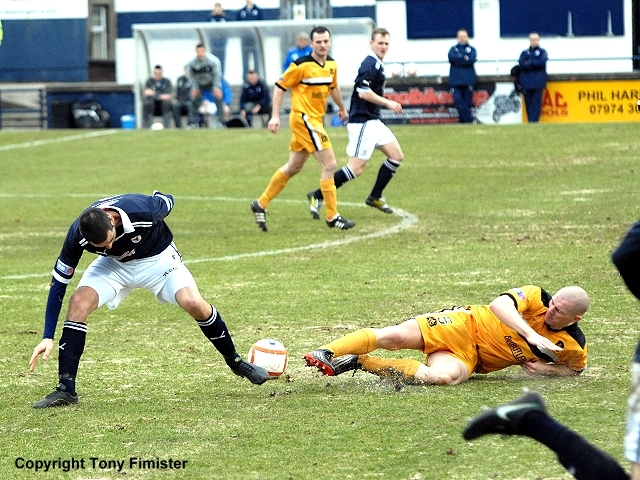 As the home crowd’s thoughts turned to the interval, Dumbarton drew level with the last kick of the opening period. 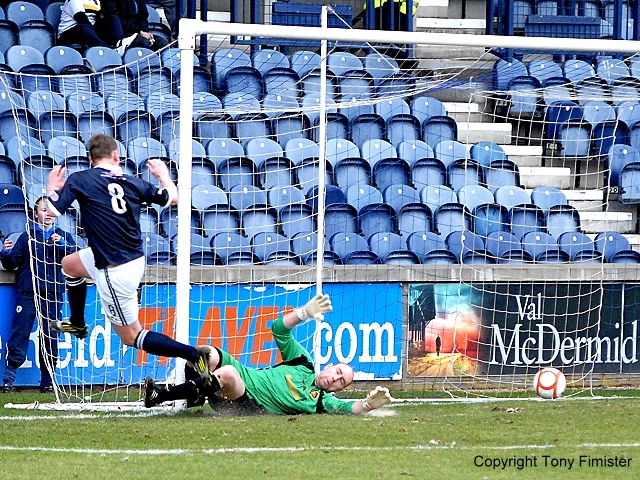 A slick move saw the ball played out wide to Bryan Prunty, and the striker’s low shot found the bottom corner of the net off the back post. Perhaps stung by the equaliser, Rovers started off the second half on the front foot, and within five minutes they had regained the lead. A long pass down the left by Stuart Anderson picked out the ever-willing Graham, whose cross into the box was cleared out as far as Pat Clarke. The striker showed composure and no less skill as his side-footed shot from the edge of the box flew high into the net, giving Grindlay no chance. The injured Grant Anderson then made way for David Smith as Rovers sought to extend their lead, although it was the visitors who restored parity for the second time when they equalised with an hour played. The Rovers defence failed to clear their lines as a long cross fell into the penalty area, and Prunty latched on to the ball to despatch a shot high into the net past the helpless McGurn from close range. 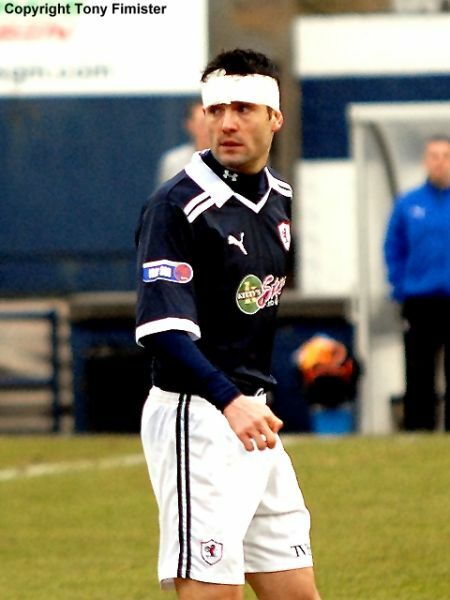 Rovers manager Grant Murray then made his second change, Greig Spence replacing Joe Hamill. Rovers subsequently pressed forward at every opportunity, peppering the visitors’ box with crosses from either flank, although it looked as if a third goal would prove elusive. It was clear that neither side was content to settle for a point, as the closing stages of the match ebbed and flowed from one end to the other. 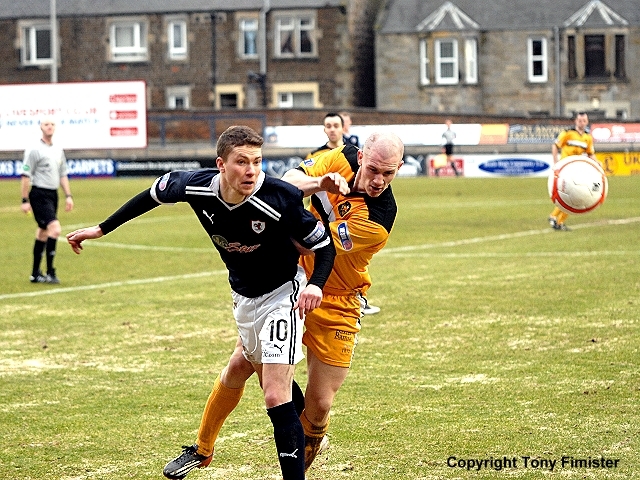 Chances were created, with Dumbarton soaking up Rovers pressure, and looking to hit back on the counter-attack. 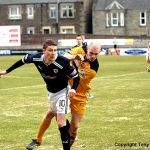 Both Ellis and Stuart Anderson were cautioned for identical blocking tackles as they sought to prevent Dumbarton breaking up the pitch. 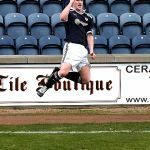 At the match entered the 90th minute, a long ball from man of the match Simon Mensing found the head of Clarke, whose astute flick fell invitingly for Jason Thomson. 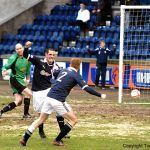 The full-back then deftly cut the ball back across the Sons box, where the predatory Brian Graham wasted no time in driving the ball home from twelve yards out. There would be no time for Dumbarton to draw level yet again, and the final whistle was greeted with a mixture of joy and relief by the home fans. It could be said that both sides deserve great credit for producing such an entertaining spectacle despite the difficult playing surface, although Rovers will claim the plaudits for what was a hard-fought 3-2 victory against opponents who are making a mockery of their former tag as relegation favourites. In that sense, Rovers can be satisfied with their afternoon’s endeavours. 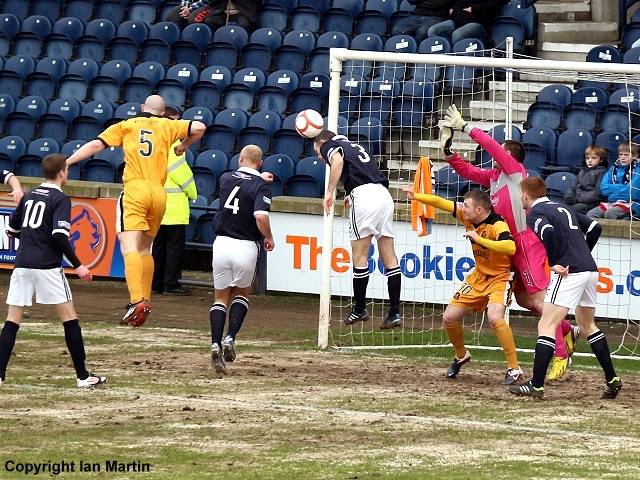 Graham has the ball in the net but play is rightly called back for a foul by Clarke. Anderson's cross makes its way to Clarke whose shot is blocked by a defender. Rovers playing with 10 men. No sign yet of Ellis. Prunty brings Clarke down on the breakaway and receives a booking. Graham shoots and Grindlay bricks. 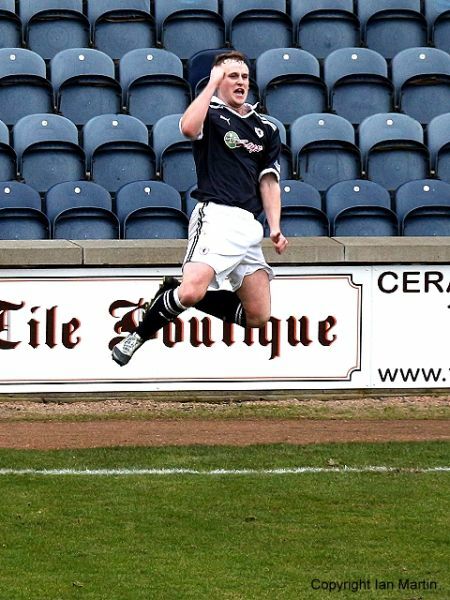 SONS: Grindlay, McGinn, Smith, Urquhart, Lithgow, Phinn, Fleming, Agnew, Lister, Prunty, Lamont. Subs: Creaney, Ronald, McCusker, McDougall, Lumsden (gk).